DESCRIPTION Within this cherry finish, single wine bottle gift box is a pour spout, bottle stoppe..
Scholle 3 liter wine bag. ..
Scholle 5 liter wine bag. .. DESCRIPTION The perfect gift deserves a special package. This sophisticated wine box is emb.. Cool, pour and preserve with the CHILL. Just pour the first glass, insert the cooling pour spout and..
Carlotta Wine Clutch Azure (P/N PSM-112(AC)). Features a soft cocoa suede lining with an elast..
With an old world charm, aged wood finish, brass accents, luggage straps and a vintage map design, t.. DESCRIPTION Our 2-bottle Treasure Map wine gift box has old world charm. It comes with an aged wo..
Richly adorned with weathered wood, brass and faux leather, this nautical box is the perfect home fo..
High quality meets function. Now you can cool, pour & preserve with the DELUXE CHILL. Just pour ..
Connoisseur Wine Bag (P/N WB60-002C). The interior side pocket can be used to hold a corkscrew..
Give the fashionista in your life a bottle of wine in a bag they can relate to! These fun and flirty..
Our Digit Wine Thermometer sports an easy-to-read LCD screen displaying your wine’s temperatur..
Burnished brass accents meet faux leather straps and a weathered exterior to make a wine box inspire..
Black Tub Cooler (P/N PSG-221B). Get ready for outdoor partying with this collapsible cooler. .. DESCRIPTION Say goodbye to lukewarm drinks with the HOST FREEZE! Just pop in the freezer, pour an..
French Wine Carrier 6-Bottle (P/N FRCAR6). The votives will light up your table for a romantic..
Houndstooth 2-Bottle Tote with Cheese Set (P/N 398HT). Environmentally friendly, made entirely..
Leather Wine Tote 2-Bottle (P/N 4025). 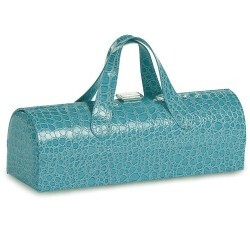 This insulated hand-made leather bag will protect and s..
London 2-Bottle Tote with Cheese Set (P/N 398L). This 2-Bottle Tote is environmentally friendl..
Mahogany 1-Bottle Wine Tote (P/N PSL-701). Whether you're heading to a picnic, concert or ..
Mahogany 4-Bottle Wine Tote (P/N PSL-704). The wine tote features a hard Mahogany leatherette ..
Tuck a bottle of wine away in a light, lithe wooden box to rest padded by packing straw until you&rs.. DESCRIPTION Tuck a bottle of wine away in a light, lithe wooden box to rest padded by packing str..
One Bottle Red Leather Wine Tote (P/N PA8340). This one-piece bag features a smooth leather ex..
Life’s a picnic, and you’ll definitely want wine. Ditch the plastic cups and keep things..
Red & White Wine Canvas Tote S/2 (P/N 2152 / 2153). Environmentally friendly, these totes ..
Back in stock! Padded dividers separate and cushion your glasses. Adjustable shoulder str..